Oops - we don't appear to have a video for the PDS-5000F. 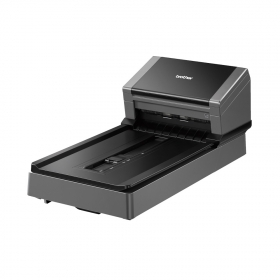 Designed with both an ADF and fixed flatbed the PDS-5000F offers high-speed, versatile document scanning for increased flexibility and productivity across the office. 2-sided scanning speeds of up to 60ppm (pages per minute) / 120ipm (images per minute) ensure that high-volume scan requirements are completed quickly and efficiently with the minimum of intervention required. The device's 100 sheet ADF (Automatic Document Feeder) and outstanding feed reliability allows high-volume workloads to be undertaken with confidence even for mixed batch scanning of a variety of document types and weights. The addition of a fixed flatbed scanning platform means that even fragile and various sized documents such as passports, magazines and certificates can be reliably scanned with ease. The intuitive control panel makes instant scanning simple with the one touch scanning feature. Ensuring original documents do not get damaged in the scanning process, the PDS-5000F boasts expert paper handling and reliability. The ultrasonic multifeed detection and reverse roller technology greatly reduces the risk of damaged documents. Advanced image processing features such as prepare and clean improve scanned image quality for storing, editing and sharing.